Good morning traders, we comfortably found fresh 2019 DAX highs this morning and the rally is honing in on that exposed POC we’ve mentioned over the last few days. Let’s take a look at the daily chart first off and I am looking at DAX CFD prices, not futures today. We have already broken to new high after the rally this morning. 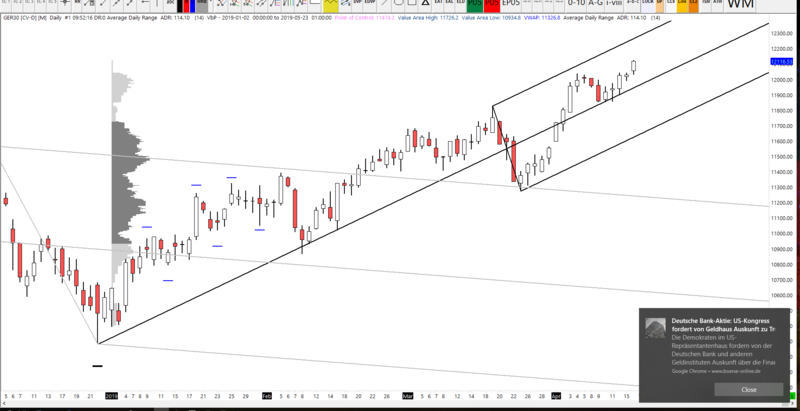 I would like to see if Dax has the momentum to now go on and reach the upper medium line parallel. However, for now we are comfortably at 2019 holidays and of course for completing a fifth consecutive bullish day. 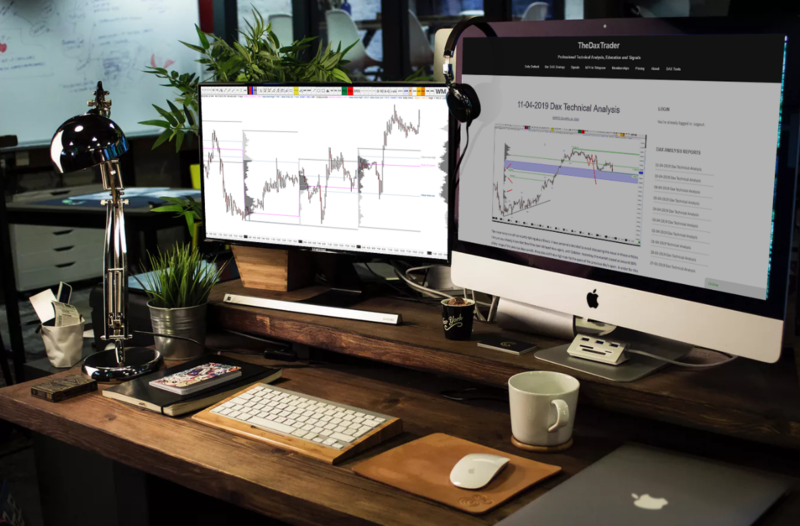 Action Center Reaction (ACR) is an excellent technique to understand and use in your day-to-day trading. This is an example of a downsloping ACR. The centreline was broken this morning with a strong Riley and price plan on to take out the reaction line. 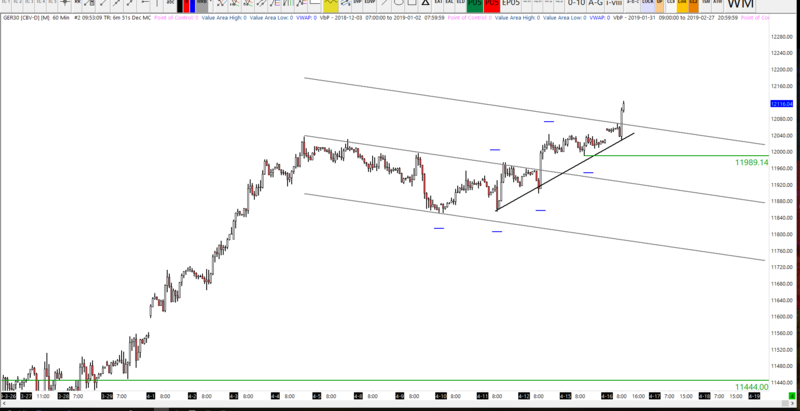 We also have an up sloping low to low trendline with three touches. This may go on to form a centreline of its own depending on how this rally continues. With a series of higher highs and higher lows, the trend is bullish above 11,989. We have had a very interesting auction already this morning. 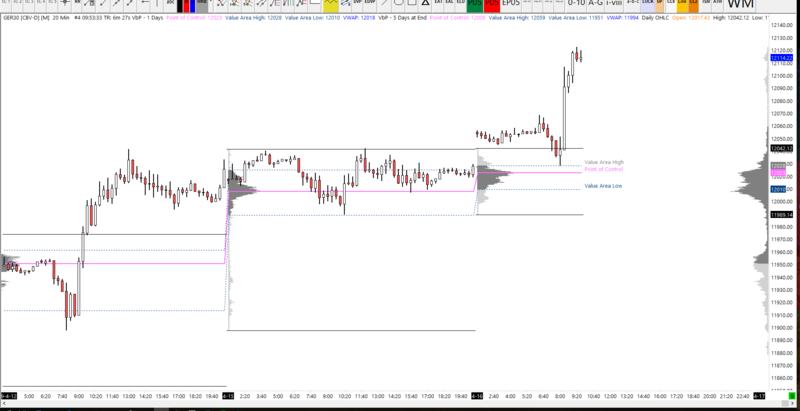 We gapped higher on open during the overnight session, then close the gap tagging the value area at high and failing to reach the point of control. The bounce from the value very highly was the springboard for this morning’s rally. On the profile to the right we have clear daylight between the high-volume zone and current price. We have said before that a common attributes of a trend is that it leaves behind POCs from previous days.